No stand-out event tent is quite complete without a shiny set of coordinating bells and whistles. 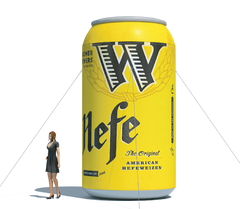 Our event tent add-ons help create an added layer of fun and flare to your company-branded station so that people take note from afar. 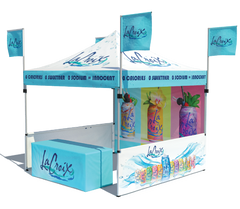 Whether you want to add ad fins with your logo printed on them or table covers in coordinating business-themed patterns, these promo tent materials create a unified theme, an added attention to detail and an extra layer of fun to an otherwise drab industry event. Ad fins are a great way to draw attention to your trade show table or brick and mortar business because they provide cleanly rendered images promoting your business in a highly portable way. If your company sits in a plaza or building tucked away from the street, these free-standing promo flags are a great way to direct business to the front door. They also make ideal markers for indoor events to help guide visitors to your table. 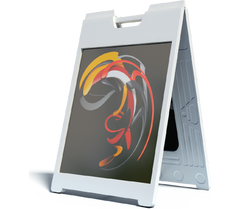 All of our custom ad fins come with a heavy-duty ground stake and a carrying case for total portability. We also offer stunning promotional table covers to help you tie your promo tent or station together in a professional, cost-effective way. These custom printed table covers come in 4-foot, 6-foot and 8-foot sizes with a four- or three-sided open back option. What’s great about business-branded table covers is that they provide premium advertising at a fraction of the cost of other promo materials, leaving you with extra wiggle room to help sustain and grow your company. We have 15 different stock colors to choose from, but can actually digitally print any color imaginable using our high-end, four-color digital printers. We also carry accessories for promotional tents, including a pop-up tent carrying case with wheels to help make transportation and storage totally hassle-free. 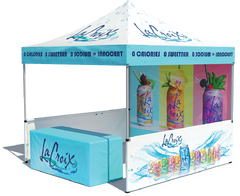 Whatever your promo tent needs, Promotional Design Group is here to meet them.